After a harrowing summer in Prague, Lumikki Andersson is back in Finland at her prestigious art school, concentrating on graduation. She lands the lead role in the school’s modern-day adaptation of “Snow White” and finds herself facing a new distraction—Sampsa, the boy playing the role of the huntsman, who has an undeniable allure that makes Lumikki conflicted about what, and who, she wants. I was the first to admit that I had been quite disappointed with the second book in The Snow White Trilogy, White as Snow. It had seemed so short! The book itself, the mystery within, had been awesome. Now, the concluding book, is perfection. Lumikki knows that something is wrong with her. It has nothing to do with having to become her namesake on stage, though she finds that to be a bit odd. She has to fight through what she feels in her heart, and what she thinks she remembers from her past. Someone out there has done a great deal of investigating her, and she doesn’t want that person to harm her or the people she is closest to. While she thinks of a particular few who might have the potential to stalk her, the truth is far more explosive than anyone likely would have considered, proving that Simukka really does have a knack for incredibly interwoven stories. 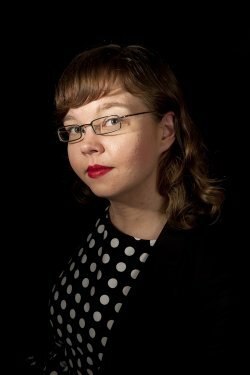 Winner of the 2013 Topelius prize, Salla Simukka is an author of young adult fiction and a screenwriter. She has written several novels and one collection of short stories for young readers, and has translated adult fiction, children’s books, and plays. She writes book reviews for several Finnish newspapers and she also writes for TV. Simukka lives in Tampere, Finland.